Kolkata giant Mohun Bagan and NE powerhouse Shillong Lajong played a 1-1 draw on Thursday in the fourth round of the I-League encounter at the Salt Lake Stadium in Kolkata. Shillong Lajong played their 160th I-League match on Thursday since they made their debut in the 2009-10 season. Both the goals in Thursday’s game came from spot kicks. Dicka scored in the 12th minute for the home side while Samuela scored the equalizer in the 72nd minute for Lajong. Lajong enjoyed a lot of possession in the first half but were not clinical enough going forward. 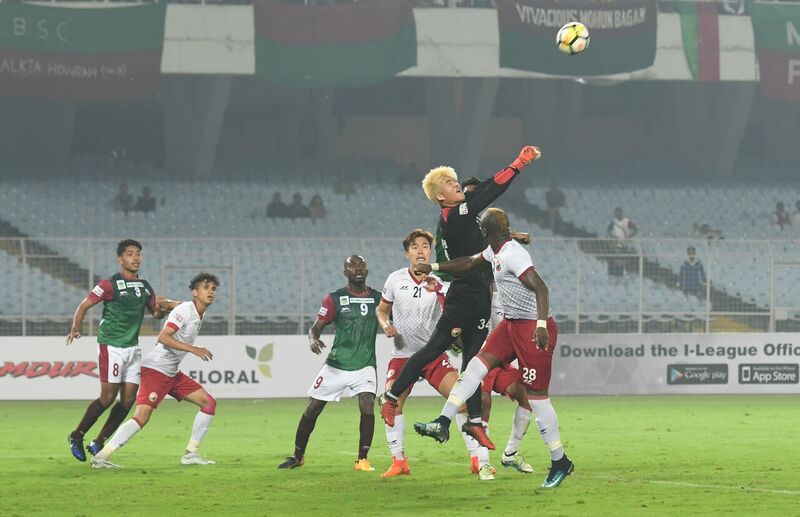 Mohun Bagan were awarded the penalty when Faiaz was brought down inside the box and former Lajong striker, Dipanda Dicka converted the penalty in the 12th minute. Lajong had to bounce back and they came very close to equalize in the 19th minute after some good passing in front of the box but Shilton Paul was quick enough to make an acrobatic save and denied Samuel Lalmuanpuia’s shot. The majority of the ball possession enjoyed by Lajong meant they created a lot of chances and looked more dangerous in front of goal. The visitors finally levelled the score line in the 72nd minute. After some great dribbling display by Aiman, Debnath was found guilty of bringing down the Lajong attacker inside the box. Samuel Lalmuapuia who scored in the previous game as well, stepped up and duly finished the penalty into the back of the net. The goal gave the young Lajong side some momentum and threatened to create an upset. The combination play between Samuel Lalmuanpuia and Aiman led to Bagan defender, Kingsley to commit a foul on Samuel Lalmuanpuia to break the attack. The referee deemed the foul to be worth a yellow card and since Kingsley already had a yellow card to his name earlier in the game, he was given the marching orders. Lajong captain, Samuel Lalmuanpuia however, could not continue any further and was replaced by youngster Lalrohlua in the 78th minute. The Mariners who were down to ten men were desperate to go forward and grab three points at home. Lajong should have capitalized on the one man advantage but could not convert their chances in the last quarter of the match.